Under the Bonnet Checks Knowing your car. The examiner also asks you the following item locations and how to carry out safety checks. You are not required to touch the items you just simply point and explain how to carry out these checks. Safety check on the Car during test for the test examiner. Safety questions on your Car during test examination. Driving Lessons Tralee, Killarney, Kenmare, Caherciveen and Killorglin in Kerry from a patient, knowledgeable female driving instructor. Brake fluid reservoir, dip stick, oil refill cap, engine coolant reservoir and windscreen washer reservoir. These maybe located differently in your car to the above so ask your instructor to point these out to you before your test. When asked: how to check the brake fluid level. Point to the brake fluid reservoir and tell the examiner you would check that the brake fluid level is between that its between the minimum and maximum level. Locate brake master cylinder reservoir. It is usually mounted on or near firewall at rear of engine compartment, almost directly in front of where the brake pedal is mounted on other side of bulkhead. …Check fluid level. …If level is low, add brake fluid to “full” line. …Replace cap/top. When asked: how to check the engine for oil. Point to the dipstick and tell the examiner you would remove it, clean and replace it. Remove it once more and check that the oil level is between the minimum and maximum mark and also that the car is parked on a level surface to give a true reading. With the engine off, open the car’s bonnet and find the dipstick. Pull the dipstick out from the engine and wipe any oil off from its end. Then insert the dipstick back into its tube and push it all the way back in. Pull it back out, and this time look at both sides of the dipstick to see where the oil is on the end of the dipstick. Engine is low on oil and where you would refill it. You would point to the oil cap and explain how, you would remove it pour the oil in to the correct level and replace the cap. You would point to the coolant reservoir and tell the examiner you would check the level was between the minimum and maximum level or if there is just one mark then to that mark. 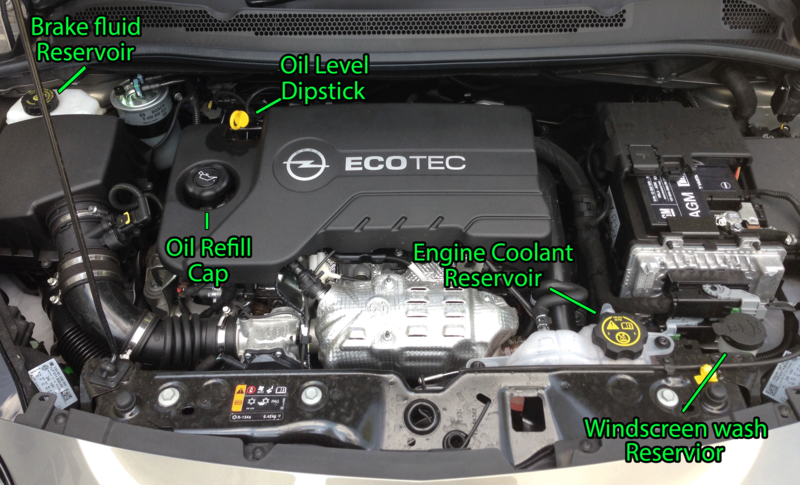 cars have a plastic coolant recovery tank (top of photo) connected to the radiator by a hose, so there’s no need to open the radiator cap itself (orange label at bottom). The coolant level should be at the tank’s MAX or HOT line when the engine is hot, and lower when it’s cold. You would point to the window washer reservoir and explain how you would refill it until full. Before you start. ..Open your hood and find your washer fluid reservoir—it’s usually a white, translucent container with a windshield/water symbol on the cap. ..Remove the cap(s) and check the fluid level in the reservoir(s). ..If the fluid is low, carefully pour some into the reservoir(s) until it almost reaches the top. You would point to the power steering reservoir and tell the examiner you would check the level was between the minimum and maximum level. Please note some cars may not have a power steering reservoir. Warm up the fluid. With the engine at idle speed, turn the steering wheel from lock to lock several times. …Locate the power steering tank. …Remove the cap. …Check the fluid level. …Add power steering fluid. …Replace tank cap. When checking the tyres you should check the walls of the tyres making sure there are no cuts or bulges. The tyres depth should be worn evenly across the tyre (if not your car needs to be tracked). The tyre depth should be over the minimum amount of 1.6mm(groves in the type should be visable). The tyres should be inflated to the correct Tyre pressure(tire’s maximum tire pressure is somewhere between 30 and 32 PSI.). Your Tyre is what connects your car to the road so check them regularly. For safety there is a Ridge that crosses the Tyre Groves. You are off to a good start on your test, it will also stay with you when you buy your first car. It is one of the most practical things you are taught whilst learning. By checking your car regularly and having it serviced not only will you save on fuel and parts costs but it may just save your life.